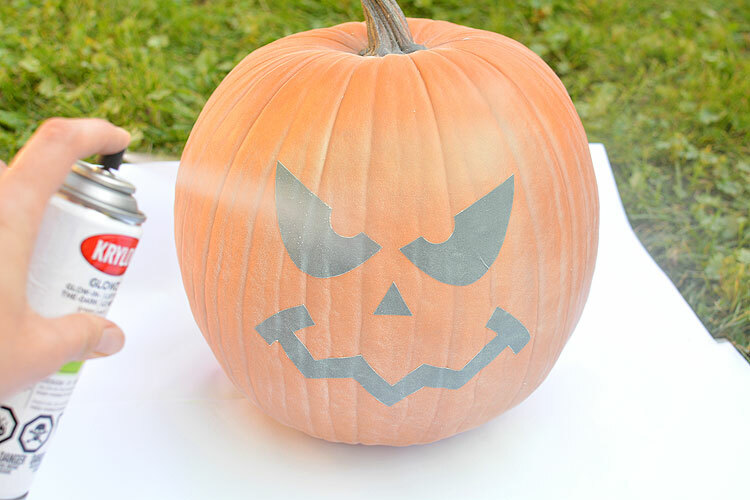 OK guys… I was brave and challenged myself to use spray paint to make these glow in the dark pumpkins! Normally spray paint scares me, but when I saw the glow in the dark spray paint on the shelf at the craft store I HAD to buy it. I’ve always been a sucker for all things glow-in-the-dark, I have no idea why. Call me a crafting geek, but I just find it so darn cool!! When I was in architecture school, they had a spray paint booth up in the loft at our school. Except by “booth” I mean “closet”. And really it was just a sealed off space to keep the fumes from getting to the rest of the school. But I don’t think there was a single vent in that room? Yikes! So I’ve kind of been scared of spray paint since then. 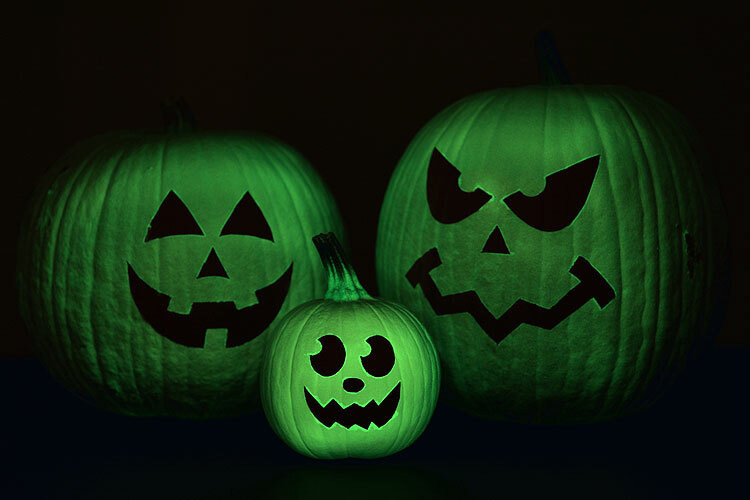 But when I made these glow in the dark pumpkins the other day, it was a warm and sunny day, so I dragged out some huge pieces of paper and sprayed everything on top of the paper on the grass in the backyard. 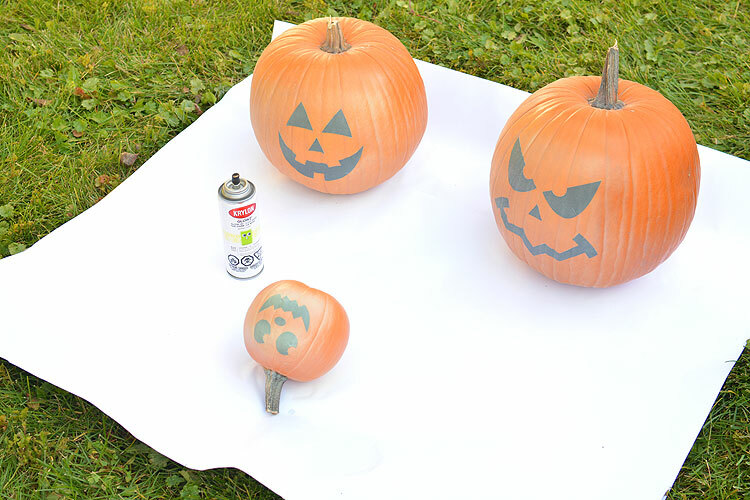 You’d probably laugh at me if you saw me spraying the pumpkins… the wind kept shifting directions so I kept dancing out of the way of the spray paint when the wind blew it towards me. All while shaking the can to keep it well mixed. The neighbours probably had a good laugh! LOL! I am definitely not an expert!! I kind of hacked my way through this project. So if you think you have a better way of doing something, by all means, leave a suggestion in the comments! Don’t feel like you have to follow my directions to a T if you make these yourself. I kind of just fumbled my way through it. 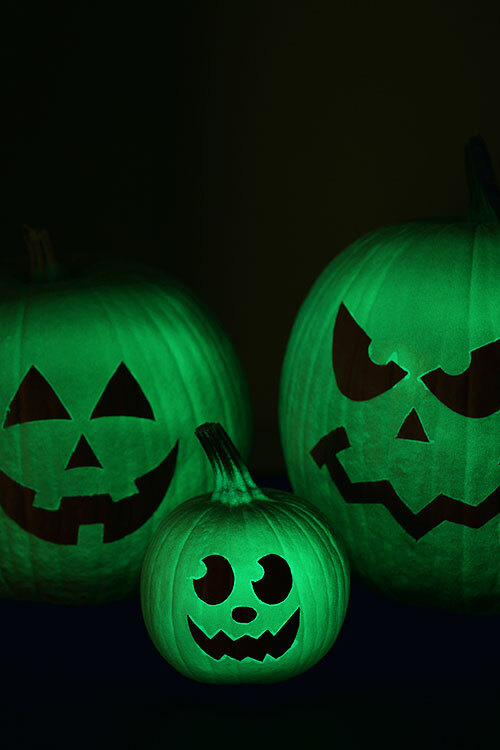 But even still, these glow in the dark pumpkins were really easy to make, and I was REALLY happy with how they turned out! It’s a really fun project! 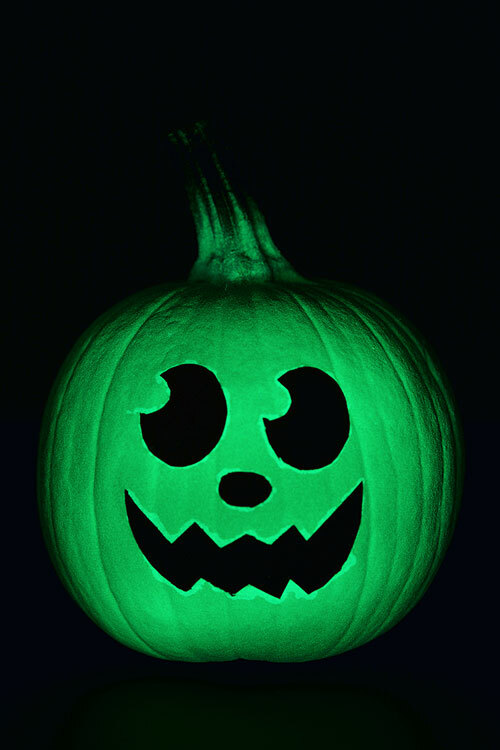 And, well, it glows in the dark, so it’s just plain cool! 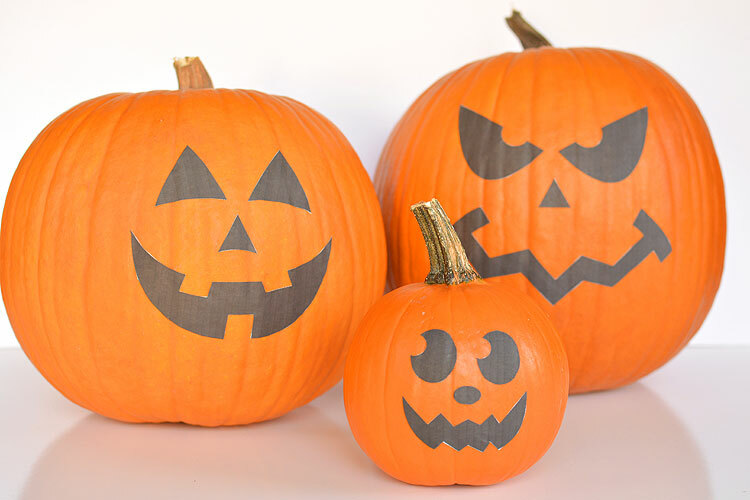 Make sure your pumpkin is at room temperature so you don’t get any condensation on it. And also make sure you clean off any dirt so the paint and face labels stick to it. You can draw the faces free hand if you like. I bet the kids would LOVE that! Or you can use my free printable templates below. 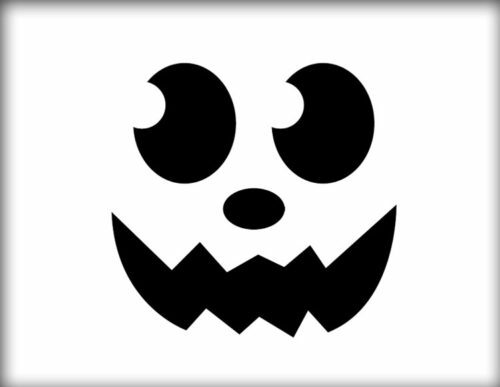 Just print them out on Full Page Printable Labels and cut out the face pieces. You need labels that are sticky once you peel the backing off. 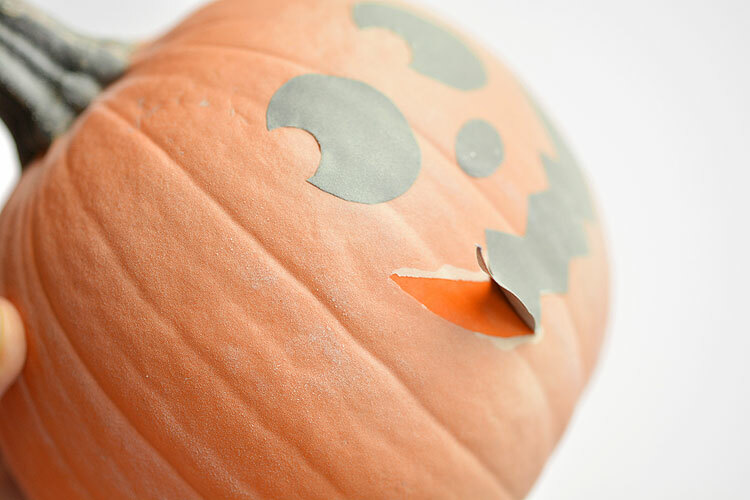 Once you’ve cut out your face pieces, peel off the backing and stick them to the pumpkin. Make sure you press down all the edges to get a good seal. You don’t want spray paint seeping underneath. I had to scale the faces slightly to make them fit on my pumpkins, but here’s what mine looked like after I attached the faces to the pumpkins. I love it already! 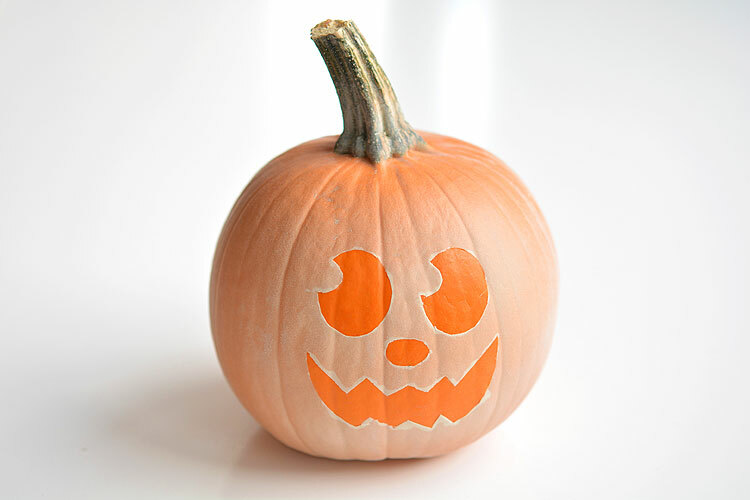 Make sure you spray the pumpkins in a well ventilated area and protect the surrounding surfaces. I sprayed them on a huge piece of paper on the grass in the backyard. The instructions said to spray thin coats and wait 1 minute before spraying another coat. So that’s what I did. I lost count of how many coats I did. Fifteen coats maybe? I sprayed the littlest pumpkin the most, and he shined the brightest in the end, so I definitely think the more you spray, the better your results will be. Wait at least an hour for the spray paint to dry. 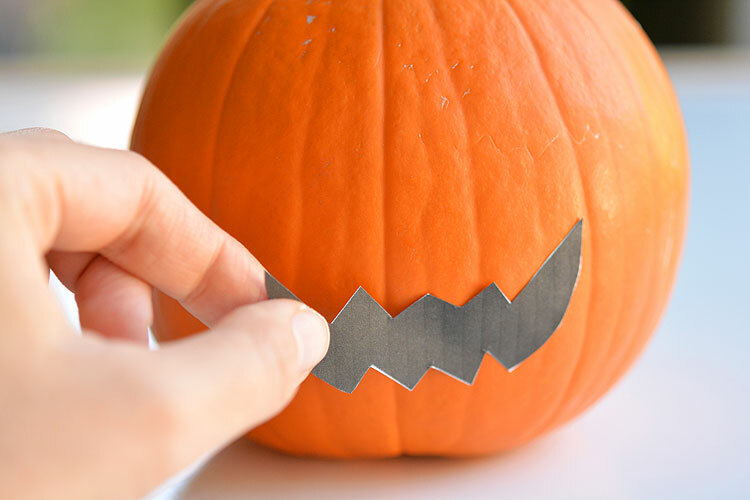 Then peel off the faces from the pumpkin. I found some of the edges tore the paint a bit when I tried to pull off the face stickers, so I had to go around the edges of the face stickers with an exacto knife to keep the paint intact. 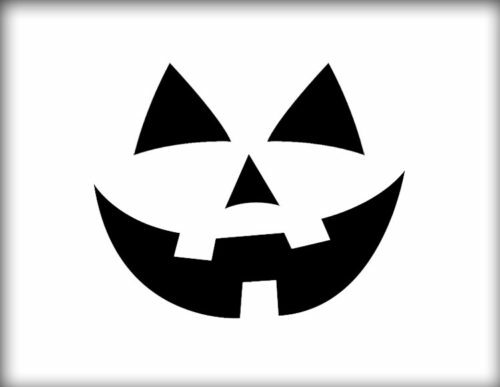 And once I removed the face, I had this awesome ghostly looking pumpkin. Which even on it’s own looks pretty awesome. And here’s all three of mine with the faces peeled off. I should mention though, that I had to “charge” the glow in the dark paint with bright light first to get them to glow like this. And the effect didn’t last for longer than a few minutes. It was more of a fun experiment that the kids (and I) found really cool! 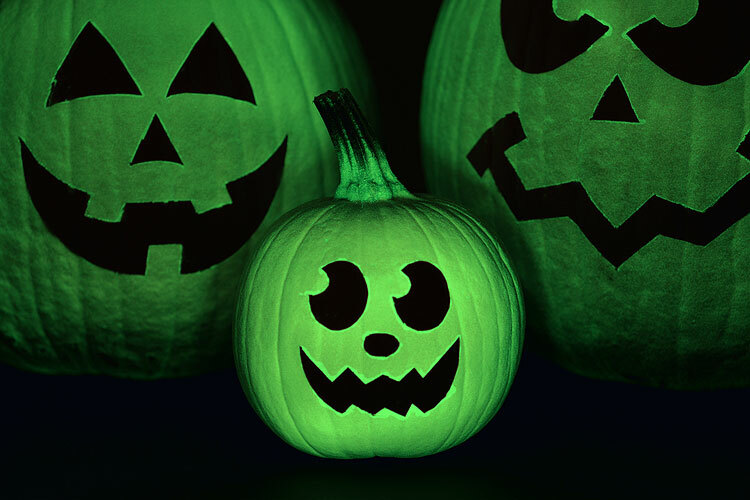 If you plan to put them on your porch on Halloween, I’m guessing you won’t be able to see the glowing all that well unless it’s really dark and you keep going out there with a bright light to “charge” them. 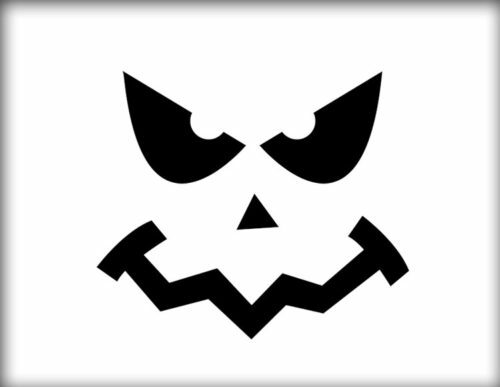 They’d be great at an indoor Halloween party though, especially if you can enhance them with a black light! 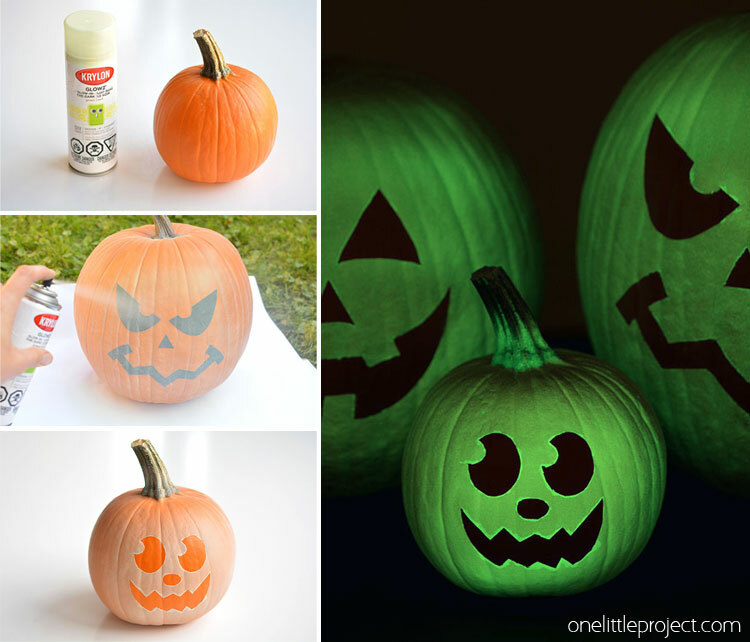 These glow in the dark pumpkins are such a fun project! The glow in the dark spray paint is just plain cool! 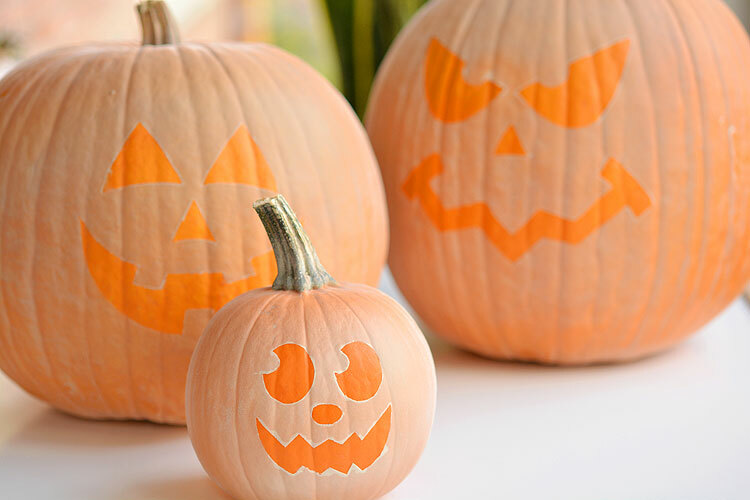 You probably won’t be able to see them glowing if you put them outside, but they look amazing inside in a dark room, and they have an awesome ghostly look during the day! 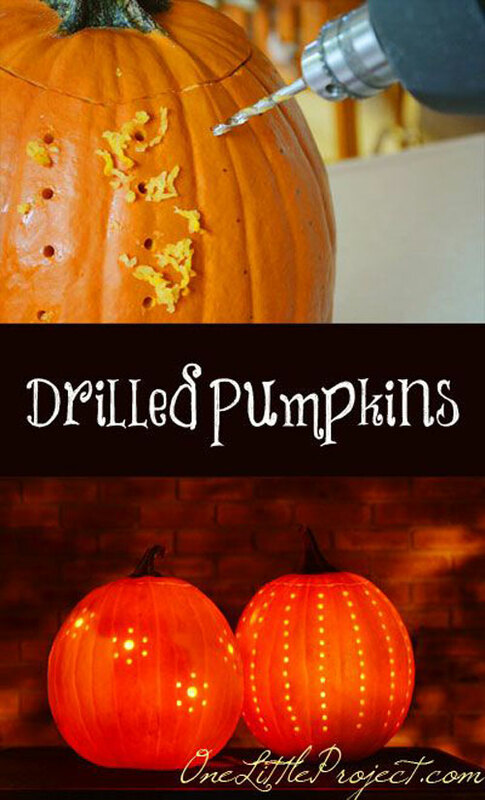 Such a fun Halloween idea! 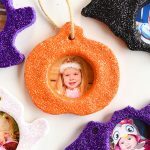 If you’re looking for more cool ideas for your pumpkin, check out our drilled pumpkins tutorial. 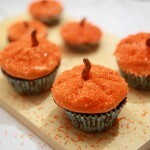 These are ridiculously easy to make, and they look soooooo amazing!!! 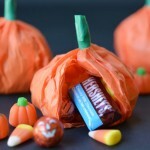 Hi, I absolutely love this idea with the pumpkin ‘s , although I was wondering if you could use plastic pumpkins instead ? 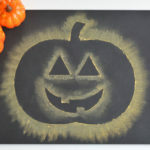 could you simply spray paint the pumpkins, let dry and then draw your face on the pumpkin? 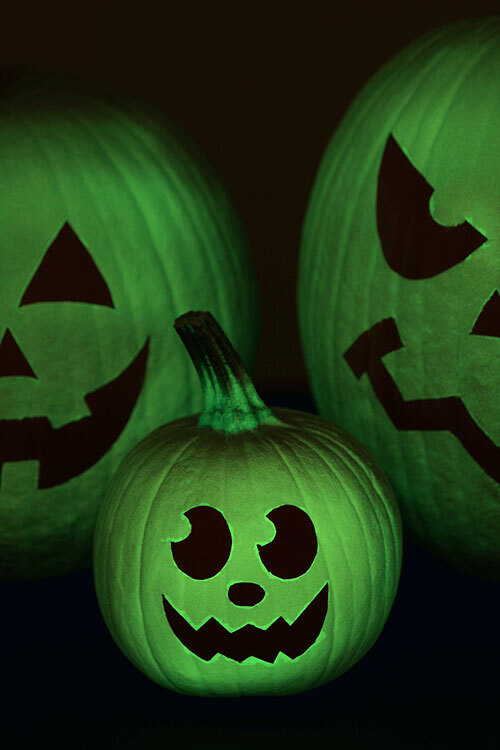 Creating glow in the dark pumpkins sounds fun. I want to try that next Halloween. 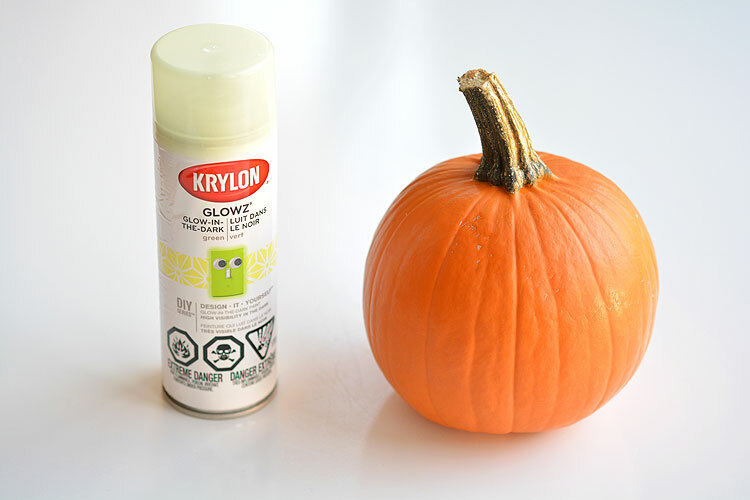 I imagine that you can use glow in the dark paint instead of spray paint.